The new X-Rite eXact Auto-Scan provides the flexibility for measuring color with spot, manual, and automated scanning capabilities. The eXact Auto-Scan enables automated and quick measurement of all patches of a color bar in under 15 seconds. This can reduce make ready times by 30 percent compared to manual scans for improved operational productivity and efficiencies. 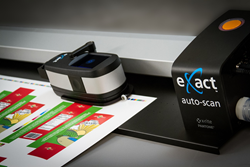 X-Rite Incorporated, a global leader in color science and technology, and Pantone LLC, announced the release of eXact Auto-Scan, a versatile scanning solution that provides press room flexibility for measuring color with spot, manual, and automated scanning capabilities. With the push of a button, the eXact Auto-Scan minimizes human error when scanning to maximize speed, reduce rework, and deliver a finished product that meets the tight tolerances customers require. The eXact Auto-Scan is part of the recently expanded eXact family, the industry benchmark for measuring color in print and packaging. The eXact Auto-Scan will be on display at the Color19 Conference, hosted by Printing Industries of America and SGIA, January 12-15, 2019 in San Diego, CA. Supports all industry print standards: G7, PSO, ISO, SCTV, and Japan Color. Provides access to the latest Pantone libraries and PantoneLIVE™ standards. Enhances spot color handling with the creation and management of standards and color libraries on each device. Delivers fast, press-side, fully-automated capabilities with readings under 15 seconds. Provides immediate, comprehensive reporting of color data through Bluetooth technology, allowing the user to make prompt adjustments to the press run. Integrates with closed loop and third-party solutions such as Rutherford Graphics and Digital Information to deliver complete ink key control. The eXact Auto-Scan will be available in March 2019. For more information visit https://www.xrite.com/categories/scanning-instruments/exact-autoscan. What’s New in Color Standards and Specifications, Ray Cheydleur, Printing and Imaging Product Portfolio Manager, 10:00 - 11:00 a.m. on Monday, January 14. Imaging Spectrophotometers: The Wave of the Future, Tim Mouw, Manager, Tech Support and Applications, 4:00 - 5:00 p.m. on Monday, January 14. PantoneLIVE is a cloud-based solution that enables the PANTONE Color language to be communicated and targeted for accurate color production across the entire supply chain – from design concept to final color production. The PantoneLIVE family includes PantoneLIVE Design, PantoneLIVE Production - Print & Packaging and PantoneLIVE Production – Plastic, Coatings and Textile. The different offerings are tailored to meet the specific needs of designers, color material suppliers and manufacturers working with paper, film, plastics, coatings and textiles. The PantoneLIVE family is supported by licensed hardware and software that enables each area of the packaging, plastic, coatings and textile supply chains to access spectral data for matching PANTONE® Colors and specific brand palettes. This results in consistent and repeatable color across product families, for a cohesive brand approach regardless of material, media or print technology. For more information, please visit http://www.pantone.com/live.